Some things really were meant to be. 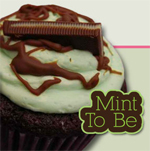 For example, take our buttermilk chocolate cake, mint frosting, topped with an Andes mint and chocolate ganache. A match that was truly made in Heaven. Don't be fooled by their size- these Cuffcakes pack a powerful punch. A moist cupcake made with real fresh strawberries and cream cheese icing. You'll taste the difference! For the truly sophisticated, try our buttermilk chocolate cake and vanilla buttercream frosting (made with real Mexican Vanilla!). Simple goodness. Moist chocolate cake, Vanilla fluff frosting, and a graham cracker crust. Reminiscent of a campfire treat, this treat will leave you wanting more. A true peanut butter lover's dream. This chocolate cupcake boasts a rich peanut butter frosting with a Reese's filling. Not for the faint of heart. Imagine buttermilk chocolate cake, Vanilla buttercream frosting, filled and topped with Snickers, and drizzled with gooey caramel. A local favorite, inspired by a lost bet. Buttermilk chocolate cake filled with yummy cookies and cream goodness. Its topped with light Vanilla fluff frosting and a dusting of cookies and cream chunks. No, I'm not kidding. This light cupcake is made with real sweet potatoes and cream cheese frosting with a hint of cinnamon on top. Delicious! Cuffcakes are $1.50 each. Minimum order is 6. Jumbo Cuffcakes are $3.00 each. Minimum order is 6. If you don't like being told what to do, pick your own flavor combination! Your Options Are...endless really! You can mix and match from the current flavor selection or request something new..